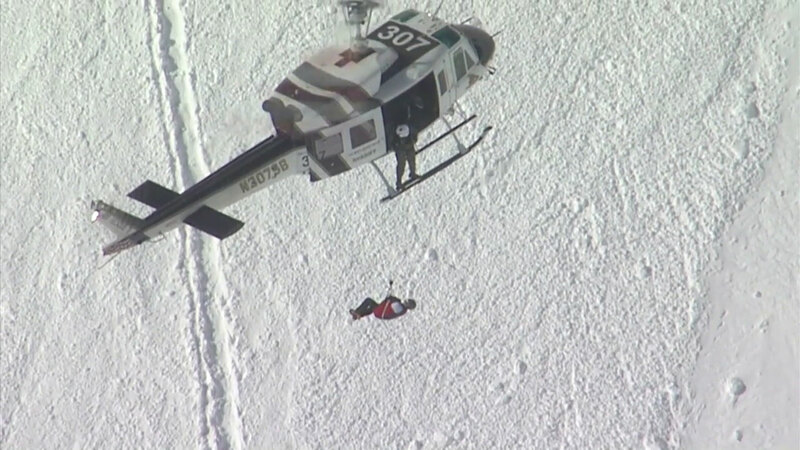 Rescue crews hoisted an injured hiker into a helicopter after an avalanche on Mount Baldy. MOUNT BALDY, California -- Emergency crews rescued three hikers who had been injured Thursday in an avalanche on Mount Baldy. Officials say four people were hiking on top of the Baldy bowl when the avalanche occurred. Three slid down about 200 to 300 feet into the bowl. Two were injured, including one with serious injuries. The seriously injured hiker was hoisted into a helicopter and transported for medical attention. The copter then returned for the second hiker. The third hiker declined medical attention and hiked out of the area on his own. Firefighters said given the distance they fell, the incident could have been much worse. "It could have been a body recovery," said Battalion Chief Doug Nelson with the San Bernardino County Fire Department. Rescue crews assisted an injured hiker on Mount Baldy after an avalanche. Mount Baldy is in the San Gabriel Mountains, north of Upland.